Whenever our girls crave for spaghetti carbonara, we look no further but Pizza Hut. Spaghetti carbonara at Pizza Hut suite their taste. 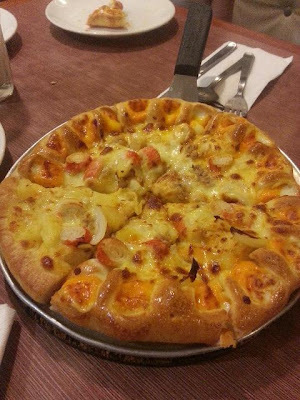 Last Wednesday at Pizza Hut, we topped up additional RM5.00 to get a stuffed crust pizza, we love those cheese. But their staff made a mistake in our order, serving us an ordinary Island Supreme. Due to their mistake they let us have the "wrong" pizza and order their kitchen to bake the stuffed crust pizza for us. We were all full after having the "wrong" pizza when the stuffed crust was served. We had a slice of it and the rest were "supposed" to take away. Few hours after we reached home, I realised that I did not collect the stuffed crust pizza that I asked to tapau. While waiting to pay, Clet brought Pearl to the car. I left the shop right after I got the change from the cashier, I hurried and forgot all about the delicious cheese crust pizza. Since I am blaming him for going to the car earlier without waiting for the tapau, Clet asked me whether we should drive to Pizza Hut to collect the pizza or not, it's already 10pm. Of course no la..!! would you?? This whole pizza that we left at Pizza Hut. Can you spot a different slice of pizza?? 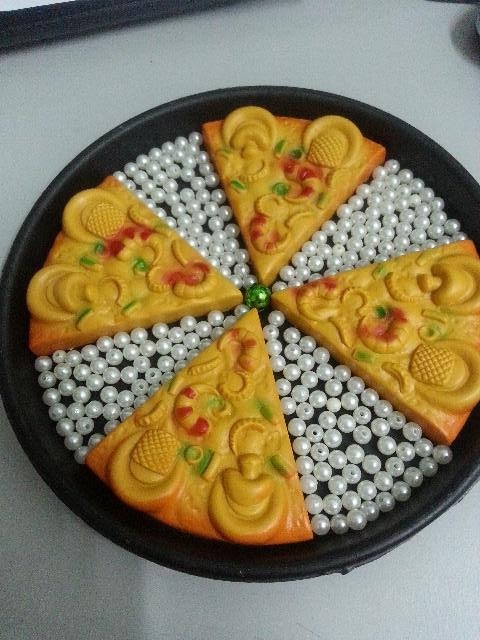 At home, my girls put together their own pizza, my plastic pearl beads become their toys. Depending on the distance, if it is too far, then not worth driving back considering the time and petrol consumed. The pizza looks so real in the last pic I thought they were real at first glance. pizza .... my all-time favo food. Now, you make me think of I should order Pizza from PHD on 5 May, as we will be gluing to the TV for the Election result. I don't mind having some pizzas once a while. I prefer Pizza Hut rather than Dominos and others.